Thesprotia, Igoumenitsa, Sivota, Ipiros, Epirus, Vacation in Greece, Hotels in Greece. 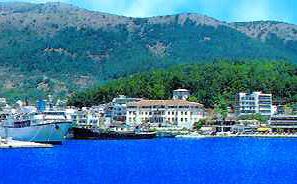 Igoumenitsa: is Greece's third passenger port after Pireaus and Patra, with almost hourly ferries to Corfu, several daily to Italy, and more sporadic connections to the Ionian islands of Pαxi, Kefalloniα and Ithaki. Levelled during the last war and rebuilt in a sprawling, functional style, it's a place most travelers aim to pass through, but since the majority of ferries leave early in the morning, an overnight stay is often necessary. Sivota is a mountainous region of the north west. 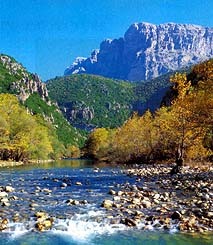 This is one of the loveliest areas of Greece – green, scenic and traditional with little organized tourism. Sivota enjoys a setting of remarkable beauty. All around are hills blanketed by pine, cypress and olive, the trees in many places reaching the water’s edge. The twisting coastline is indented with rocky coves, sandy bays, and stretches of almost white coarse-sand fine shingle beach such as Mega Ammos a mile outside the village. Just off-shore are three wooded islets with beaches of their own, great fun to explore by boat, maybe taking a picnic. The hire of a small motorboat is recommended and is the only way to reach not only the islets in the bay but also nearby hidden beaches. The village itself has plenty of Greek charm. Only in August is Sivota very busy, largely with holidaying Italians and Greeks themselves; and during this short period the village, harbor and beaches bustle with life. The harbor is pretty as a picture, with an array of cafιs and restaurants (some quite smart), a handful of shops, and often a flotilla or two moored at the quay. A ten minute walk brings you to the greater part of the village, with church, stores and more taverns. Over the headland is the town beach – sand/shingle with canoes and pedaloes usually available for rent – and a little further are two white shingle bays.